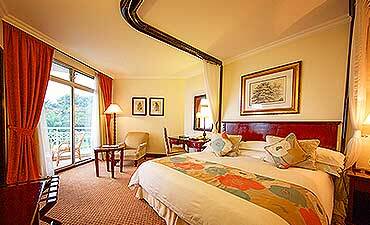 Are You Planning A Rwanda Safari To Lake Kivu? 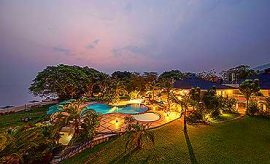 Scroll Down..
As a part of their holiday itinerary in Rwanda, discerning travelers seeking relaxation after their gorilla and primate safari trek make it a point to spend some time on the shores of the stunningly beautiful Lake Kivu. With its 60 species of avian life, the locale is known for its serenity and sandy beaches, where you can relax, sunbathe, or simply enjoy a rejuvenating siesta. The calm surface of the lake conceals a geothermal uproar beneath, enough to earn it the distinction of being one of three "exploding lakes" in Africa. Located on the western edge of the country, the lake sits above the Albertine Rift, a deep split in the earth that's related to the same roiling activity below the surface that produced Rwanda’s volcanoes. In some sections on the rims of the lake you may spot hot springs, which are evidence of the gases bubbling up from rifts in the earth far below the bottom of Lake Kivu, one of the deepest water bodies in Africa. The lake, however, is generally safe for swimming and enjoying a variety of water activities during your tour of Rwanda. With a surface area of around 2700 square kilometers (1042 square miles), the lake is, in fact, one of the safest in Africa; it hosts no dangerous animals like hippos or crocodiles. The lake supports a thriving marine life and is especially famous for the isambaza, a small, delicate fish. Traditional anglers devised an ingenious method for catching them, using lanterns at night to draw them to the surface. 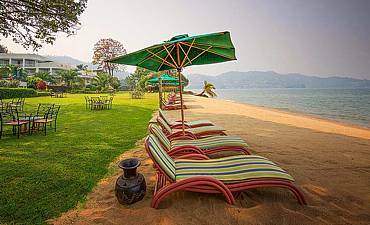 The lake also teems with species such as the Nile tilapia, barbus, haplochromis, clarias, and the Tanganyika sardine. Perhaps spend a leisurely afternoon trying to catch one of them for your dinner. Should you take a speed boat cruise on the lake aboard the Munezero, you will see that it is cradled by hills and offers picturesque vistas. Look out for the location where the lake empties into the Ruzizi River on its way to the Tanganyika River to the south. Many small town and village settlements lie along the shores of the lake, including Sake, Goma, Kalehe, Bukavu, and Kabare, in the neighboring Congo. On the Rwanda shore are the three lakeside towns: Rubavu, also called Gisenyi, Cyangugu, and Kibuye. Rubavu is well known for its tea and coffee plantations, where the finest of the country’s coffee is grown. You can visit the area to sample the exquisite flavor of the local brew, a must-do activity on your Kivu trip. 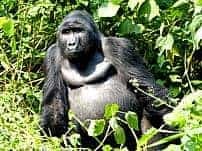 You can also pick up the Congo Nile trail from Rubavu, which will take you through banana groves, rainforest, and woodlands fragrant with pine trees. Lake Kivu is also home to a collection of islands, each of which is like its own delightful and unique world. Visitors to Napoleon Island can seek out the colony of bats that has taken up residence there. You may also spot some of the water birds endemic to the region, including the pied kingfisher. 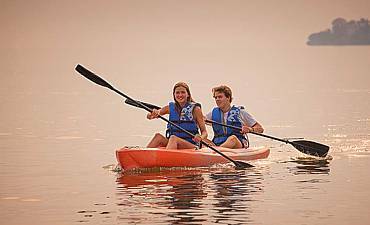 Water sports enthusiasts will love active-vacation activities such as water-skiing, jet-skiing and windsurfing, while those seeking calmer ways to enjoy the water may wish to hire a canoe or kayak and go paddling during their tour of the Lake Kivu environs.